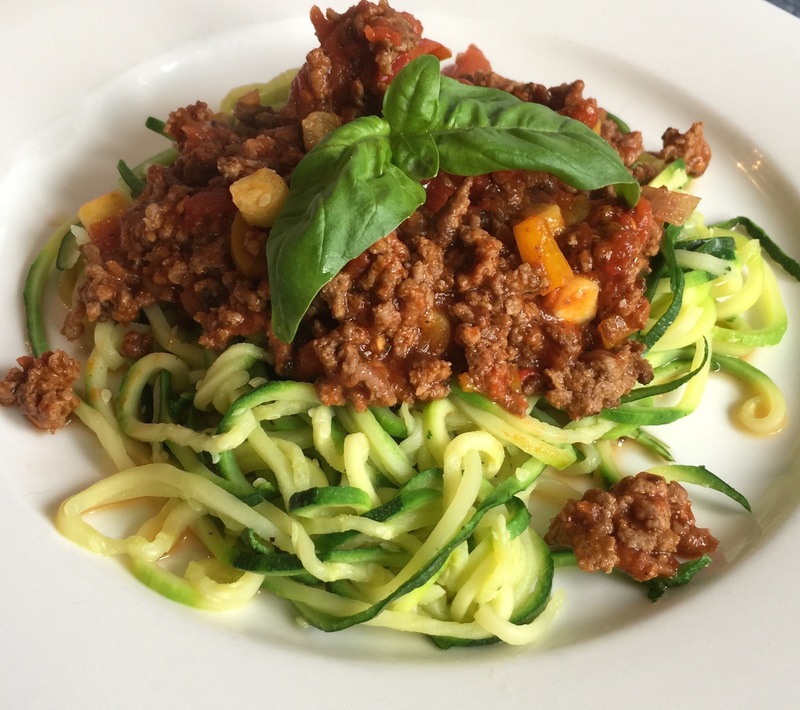 Zoodle Bolognese – #lchf, paleo, primal and very tasty. Spaghetti bolognese or Spagbol is the goto meal for many a busy cook. Meaty flavoursome sauce served over spaghetti topped with grated cheese. Simple and easy to prepare – I have missed it’s satisfying comfort when I stopped eating wheaty pasta. But needs must and I love how old favourites with a bit of substitution can be rejuvenated to form part of paleo/primal, low carb eating. I rediscovered SpagBol and its deliciousness once I started using a spiralizer to make zoodles. Zoodles are spiralized (or julienned) zucchini. I love how when you spiralize or sliced really thinly something like zucchini, it can taste like pasta once it’s are under a delicious sauce. The vegetable absorbs whatever sauce is on them – just like pasta. So then, I challenge anyone to say that putting your sauce on top of lightly cooked vegetables is not so much better for you than putting it onto a pile of carb laden, gluten laden pasta. This dish tastes great straight after cooking but if you leave the sauce for a day then reheat the favour is even better. Top it with shavings of parmesan cheese and you have the ultimate comfort food on a plate. Heat the oil/dripping in a large frypan. Fry the meat until brown then add all the other ingredients, accept the shaved parmesan cheese. Cover and bring the mixture to a boil, then turn the heat down to a low simmer. Serve over a big mound of lightly cooked zucchini and freshly shaved or grated parmesan cheese. While the meat is simmering wash then top and tail the zucchini. Spiralize or julienne each zucchini. Finely chop any left-over zucchini and add to the beef sauce mix. Place in a deep pot and just cover with salted water. Bring to the boil and then drain. Serve. Don’t miss any new recipes hit the Follow & Get Free Recipes button! Where does one find a spiralizer?